Top banks continue to behave as if they are solvent institutions with functioning balance sheets, they are totally bankrupt without Fed & Central Bank intervention. The collapse of the Western Financial System already occurred years ago. Even though the top banks continue to behave as if they are solvent institutions with functioning balance sheets, they are totally bankrupt without Fed & Central Bank intervention. This was explained in detail in the video: FED AUDIT SHOCKER: They Came From Planet Klepto. I posted this video on my site last month and I continue to urge readers to watch it as it provides actually data showing how the Federal Reserve propped up the top U.S. banks with trillions of Dollars in sweetheart deals. While the majority of Western Investors fell for this scam, HOOK, LINE & SINKER, a small percentage of the population realized this signaled the peak and end of the U.S. Fiat Dollar Monetary System. We can see this huge world-changing event take place in chart below. This chart is one of the few I have made public from my THE SILVER CHART REPORT. 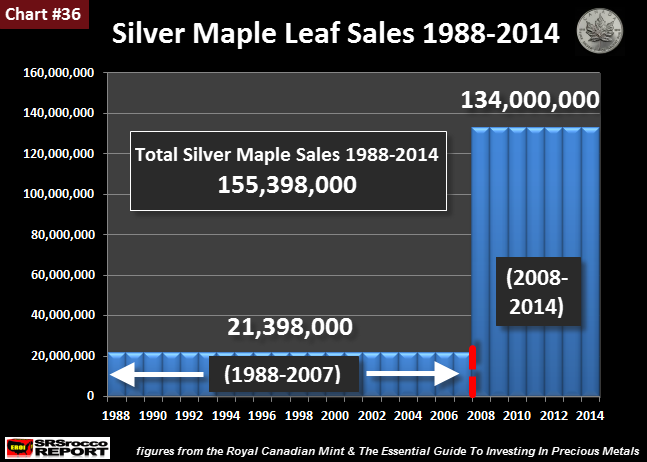 Chart#36 shows total sales of Canadian Silver Maples from 1988 to 2014. There is no other chart of its kind on the internet. I broke down Canadian Maple Leaf sales in two periods. In contrast, a total of 134 million oz (Moz) were sold from 2008-2014, at an average of 19.1 Moz a year. Basically, investors purchased 17 times more Canadian Silver Maples a year from 2008-2014 (7-year time period) compared to 1988-2007 (20-year time period). This huge spike in Silver Maple buying after 2007 also took place with the U.S. Mint Silver Eagle sales (chart included in The Silver Chart Report). As we can see, sales of Silver Maples doubled from 3.5 Moz in 2007 to 7.9 Moz in 2008. However, Silver Maple sales in 2014 (29.2 Moz) were more than eight times higher than in 2007 (3.5 Moz). This huge jump in Silver Maple Leaf sales shows that investors continue to purchase record numbers as they realize the financial system is weaker than ever. 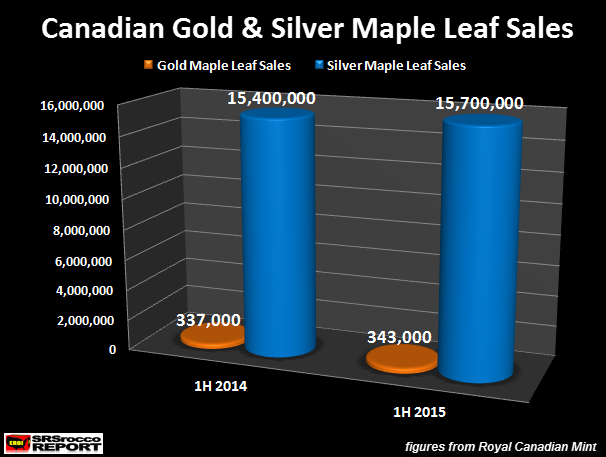 According to the Royal Canadian Mint Q2 2015 Report, Silver Maple sales increased 300,000 oz from 15.4 Moz 1H 2014 to 15.7 Moz 1H 2015 (Note: 1H = first half of the year). 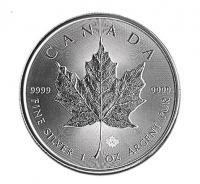 I would imagine sales of Silver Maples will surpass 30 Moz in 2015… if the Royal Canadian Mint is able to continue supplying the market with product. The first chart showing the huge increase of Silver Maple sales after 2007, signified the collapse of Western Financial System. Investors continue to purchase record amounts of silver bullion (especially Official Silver Coins), as they realize the financial system was never fixed and grows weaker each day.